The Darvas Box (DB) was authored by Nicholas Darvas. The DB system uses highs, lows and a series of logical states to draw boxes around specific groups of price bars. Signals are given when the price breaks through the box. Like other trading strategies, the Darvas Box is a break out momentum strategy. Developed in 1956 by ballroom dancer Nicolas Darvas, this strategy enabled him to turn a $10,000 investment into $2,000,000 over 18 months. Naysayers attributed his success to the bull market that existed at the time, and were quick to say that similar results couldn’t have been achieved in a bear market. It is also said that Darvas achieved peace of mind from following his strategy, and was less hyped about the money that he made. The Darvas Box uses fundamental analysis to determine which stocks to buy or sell, and technical analysis to determine when to trigger the trade and when to exit the market. Darvas’ fundamental philosophy was to invest in growth stocks. He looked at an increase in volume for confirmation in industries that he expected to grow. Then, he used the Darvas Box method for his entry and exit strategy. Even though Darvas used this method for his stock portfolio, this indicator can be used on any trending market. 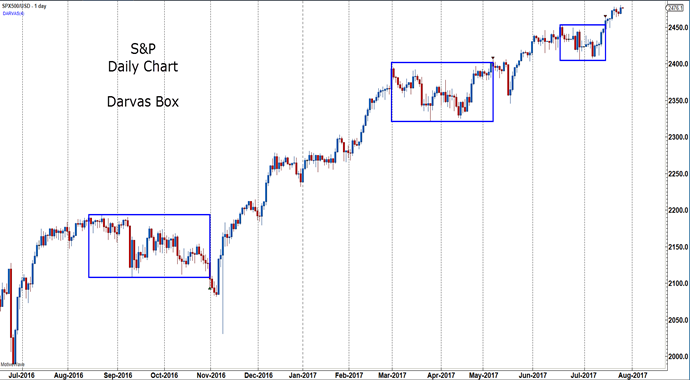 In the S&P Daily Chart below, the Darvas Box is automatically drawn with bullish price action. The first step is to look for signs that a market is trending or about to trend. This can be done by looking at the fundamentals and focusing on the stocks or markets that are starting to move. Create a watch list. After deciding that a stock sector, currency grouping or commodity is about to trend, then use the Darvas Box for entry and exit signals. Just as with all indicators, the Darvas Box gives false signals too. Traders need to take that into account. Darvas looked for stocks that were trading in a narrow price range, which he defined with trading rules. The Darvas Box floor represented a new 3-day low price that held for at least three consecutive trading days. The ceiling of the box represented the highest price a stock reached in the current advance that held for at least three consecutive trading days. After noting the ceiling and floor, Darvas would cable his broker with a buy order just above the ceiling and a stop-loss just below the floor. From his experience, when boxes piled up, forming new boxes as the stocks moved higher, he would take multiple positions and always move his stop to just below the new floor. 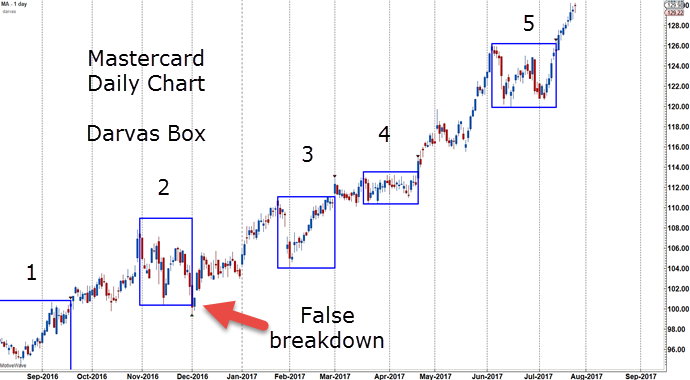 Example: In the Mastercard Daily chart below, 4 out of the 5 signals are bullish signals, and signal 2 was a breakdown in price below the box. That box would be ignored as Darvas only took bullish signals. The initial long position is taken with the break out of box 1. There are potentially 3 long addons from this strategy with boxes 3, 4 and 5 and as price moves higher, stops are moved to just below the last floor of box 5. These boxes are drawn automatically on the MotiveWave platform and visually, this indicator is very appealing. It offers a clean breakout strategy with defined entry and exit rules. Learn how the Darvas Box helps put traders in the trend as it is progressing, as a breakout strategy. Start incorporating the Darvas Box into your chart set-up. Finally, use the Darvas Box in developing trading strategies with other indicators. The Trader’s Pendulum: The 10 Habits of Highly Successful Traders. Copyright (c) 2015 by Jody Samuels. This book is available at all bookstores, online booksellers, and from the Wiley web site at www.wiley.com. This entry was posted in Trading Tips and tagged Darvas Box, day trading, swing trading, trade alert, trading strategy, trading system.